WASHINGTON DC, Apr 16 2019 – Sustainable development encapsulates the idea that material progress must always go hand in hand with social inclusion and respect for the environment. Delinking economic growth from the other two pillars would be an act of self-sabotage. Ancient Rome offers us a case study of how tragedy might play out—and how it can be avoided. The Roman Republic lasted 500 years because its institutions were supple enough to adapt to two great challenges—internal conflict between aristocrats and the masses and external conflict with rival states and integration of conquered peoples. Despite constant tensions, Romans were bonded by shared values—a sense of honor rooted in public service and a commitment to their conception of the common good. For generations, the center held—until it did not. At first, the changes were subtle. Territorial expansion—at the beginning of the second century BCE, the Republic stretched from Gaul to Greece—brought an influx of wealth in the form of tribute payments, taxes from new provinces, and the development of metal mines. A new class of super-wealthy Romans created financial instruments to package debt, resell it, and invest the profits in infrastructure projects. Sound familiar? In many ways, this was an ancient form of globalization, both trade and financial. And the boom times drove the population of Rome to nearly 1 million by the first century BCE, making it the first city on earth to reach that milestone. But all was not well. The new wealth was not being shared widely. A mass influx of slaves upended the labor market and left soldiers and citizens out of work and increasingly angry. At the same time, as noted by Edward Watts in his new book, Mortal Republic, wealth accumulation began to supplant personal virtue and service to the state as the main measure of success. And the elites did not spend their newfound wealth merely on villas and luxury goods. Unlike their forefathers, they engaged in large-scale bribery and corruption to secure political honors and offices, and judicial impunity. Perhaps no one person embodies the dynamic of the age better than Marcus Licinius Crassus. His fortune—generated largely by corrupt property speculation—was so vast that it matched the entire Roman treasury. And as bankroller for hundreds of politicians, he gained unrivaled influence from his wealth. It wasn’t long before the fault lines ruptured. In previous centuries, the elites responded to popular discontent by sharing power and rebalancing the political equilibrium. But under the sway of self-interest and corruption, the consensus unraveled. The same pattern played out again and again during the Republic’s last century—populist anger running into patrician intransigence, leading to overreach by both sides, often ending in violence. The cycle started with the Gracchus brothers, Tiberius and Gaius. Tiberius pushed for the redistribution of land to the poor. But his reform plan triggered conservative opposition, and he was clubbed to death. His younger brother, Gaius, picked up the mantle, focusing on social protection—in the form of subsidized grain—and fighting corruption through judicial reform. He too was killed. Following the chaos, Gaius Marius arose as the champion of the poor, riding a wave of popular disgust at senatorial corruption. 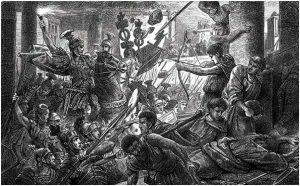 But he ultimately allied with those willing to use violence for political means, prompting a patrician backlash and the dictatorship of Sulla, who did the unthinkable—lead an army across the Roman city limits. His reign was one of mass proscriptions, property confiscation, and neutering of plebian power. In the years that followed, unscrupulous patricians such as Cataline and Clodius sought to advance their own careers by exploiting popular frustration—including by casual recourse to violence and intimidation. All of this paved the way for Julius Caesar, who used strong-arm tactics to carry out populist reforms. But after his victory in a civil war, Caesar too assumed the title of dictator and became increasingly autocratic. His murder prompted another round of civil bloodletting, effectively killing the Republic. Over the course of the Republic’s fateful final century, a succession of leaders smashed norms previously thought inviolable. Political violence became routine. The institutions of state were weaponized to persecute opponents. The mob grew increasingly angry. In turn, strongmen offered to restore order. All because of the festering wounds of inequality and corruption. Following the Republic’s collapse, Rome enjoyed a remarkable resurgence—although the peace was secured in part through the suppression of democratic institutions. What Gibbon did not know was that favorable fortune owed much to a favorable climate. As documented by Kyle Harper in a remarkable new book, The Fate of Rome: Climate, Disease, and the End of an Empire, the period between roughly 200 BCE and 150 CE is now known as the Rome Climate Optimum—a warm, wet, and predicable climate uniquely favorable to the empire’s key agricultural crops. But by the third century, the climate became cooler, dryer, and more unpredictable, with more frequent droughts and crop failures. By the middle of the fifth century, the Late Antique Little Ice Age had arrived. A changing climate reduced the empire’s resilience to a variety of shocks, including pandemics. Smallpox struck in the second century, and a virulent outbreak that may have been Ebola followed in the third. In the mid-sixth century, the Plague of Justinian—the first known incidence of bubonic plague—probably killed half of the empire’s population. Recent evidence shows the role of climate change. The decade before the outbreak of plague saw some of Europe’s coldest temperatures in two millennia, brought about by a sequence of massive volcanic eruptions. This likely forced gerbils and marmots out of their natural habitats in central Asia, causing the bacteria-bearing fleas they carried to infect the black rat, whose population had exploded along Rome’s expansive network of trade routes. To be sure, the fall of Rome had many fathers. It remains perhaps the most overdetermined event in human history. But it seems increasingly clear that the natural world impinging on the human world was a major culprit. Weakened by these hostile forces of nature, the empire started to unravel in the third century. This was a period marked by persistent political instability, pressure on the frontiers, and a fiscal crisis compounded by currency debasement. This started a domino effect of mass migration across the Roman frontier, ultimately leading to the collapse of the western empire in the fifth century. That was followed in the sixth century by the ugly trifecta of climate-change-induced crop failures, catastrophic plague, and ruinous war. It was during this period that Rome’s population fell to a mere 20,000—and the Roman forum became the campo vaccino , the cow field. The Roman Republic and the Roman Empire both fell because they failed the sustainable development test. There is a cautionary lesson for our own times in how that failure played out—a breakdown in time-honored social norms, entrenched political polarization driven by economic inequality, repudiation of the common good by elites, and environmental havoc leading to disease and disaster. We should take this lesson to heart, especially as we hear history rhyming in ways that are eerie and disconcerting. This demonstrates the utmost urgency of achieving the Sustainable Development Goals, the global call to end poverty, protect the planet, and ensure peace and shared prosperity. The Roman experience offers a window into our possible future if we fail to act. There are some important differences between our economy and that of ancient Rome, of course. Ours is vastly wealthier, healthier, more inclusive, and more resilient. The Romans did not have the ability to eliminate all forms of material deprivation, even though they could and should have better handled the inequalities arising from their own experience with globalization. We have it within our power to do both. We also have it within our power to solve the problem of climate change, by far the greatest challenge of our generation. The Romans were very much at the mercy of nature. Their activity was not the driving force behind the shifting climate, so they could do little to slow or stop its march. But since human activity is causing climate change today, it can be fixed by changing our behavior—delivering a zero-carbon energy system over the next three decades. The bottom line is that sustainable development is of enduring importance—whether we are talking about 130 BCE, 530, or 2030.